This is an energy ninja, specially trained in the electrical arts. This guy can save you money by making your electrical consumption Smart and efficient. In previous blogs, we talked about methods of lowering our electrical consumption through technology, appliances, and performance tools. However, the other side of this coin is that there a homeowner can perform maintenance chores, or hire a pro to do so, which will make his home safer and use less electricity. The big draw on homes in the Phoenix area is the HVAC system. Heating, but more critical, cooling costs can eat up a big chunk of our finances. For this reason, a homeowner should schedule a professional HVAC company to service their air conditioner. It will help prevent problems before they start, and lubrication of the moving parts will help the system run more efficiently. If your a/c filter looks like a Wookie exploded in it, you might need to change it more frequently. 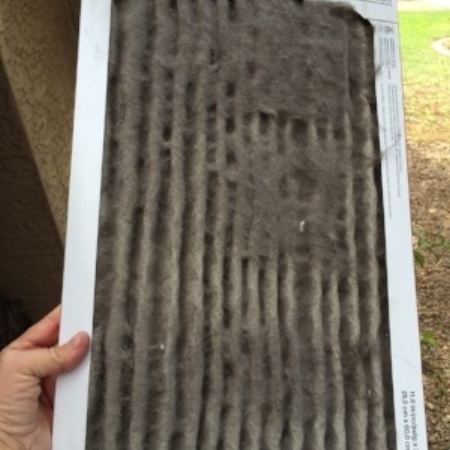 The homeowner can help this process with maintenance by changing the filter on a regular basis and keeping an eye on the thermostat if it isn’t a Smart unit. In the summer, the fan should operate in the counterclockwise direction. But, in winter, the directional switch should be flipped so the fan runs in the clockwise direction, which will draw air up (instead of blowing it down). This switch, in turn, will force the air to the edges of the ceiling and down the walls. Since heat rises, the net effect of this will be the warm air from the ceiling will arrive back down to where the family needs it. Having high-quality Energy Star appliances will rake in some serious electrical savings, however, if you aren’t in the market for new units, you can make the best of what you have. The refrigerator, which, as we said before are meant to be kept full, will benefit significantly from having the coils and condensation pan cleaned. A simple tool can be purchased from the hardware store which will facilitate the cleaning. Draining the water heater as instructed in the instructional book will prevent sludge from forming at the bottom of the tank, which forces the water heater to work harder to maintain water temperatures. Closing blinds and curtains against the summer sun’s rays with lower your cooling costs and keep the home more comfortable. But, a homeowner can keep the house even more temperate by caulking leaks, resealing windows and doors as needed, and teaching the smaller family members to keep the doors closed. One of our clients told us she spent an entire month one summer diligently shrieking at her children to shut the door behind them until it became an ingrained habit. (Shutting the door, not the shrieking.) She said as adults they’re all mindful of securing doors after they’ve opened them. If you aren’t much of a shrieker, you may want to invest in some self-closing door springs such as the type found on garage doors.